Manufacturer of Hoisting Equipment, Winches, Cargo Elevator, Windlass Crane, etc. 1. Lightweight and compact design allows easy installation. 2. 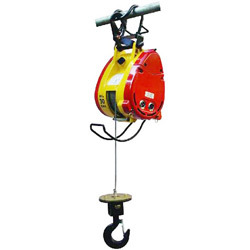 Automatic upper limit switch When rope disc touches the limit arm, hoisting is automatically stopped. 3. Dynamic and mechanical brake provides instant and safe braking. 4. Can operate on standard domestic power supply. 5. Sensor arm automatically stops motor if the wire rope is under-wound. 6. Come chiyeh with 7 m power lead and industry plug. 7. Come chiyeh with 30 m pendant control. 8. Wire rope with safety hook. 9. 360o weight hook with safety latch. 11. Heavy duty IP65 waterproof switch with emergency stop K61A as an option. 1. Lifting capacity (top layer) kg: 240. 2. Lifting speed m/min: 9 ~ 14. 3. Motor output 110V kw x A: 1.3 x 13. 4. Motor output 220-240V kw x A: 1.3 x 6.5. 5. Motor type: series wound. 6. Brake: mechanical ratchet. 7. Lifting height m: 29. 8. Wire rope Φ mm×m: 5 x 30. 9. Percentage duty cycle: 25% ED.